Swim is one of those nifty little one-trick ponies that every so often an editor just needs to trot out in order to achieve just the effect that will really make that scene. Swim is an After Effects compliant plug-in that works within FCP with the identical functionality as in After Effects. This is not always the case for many plug-ins, mostly owing to architectural differences between AE and FCP. The ability to stay within FCP for as much compositing and effects-work as possible certainly can simplify your work as an editor. Inasmuch as Swim works so well within FCP, I will confine my examples in this mini-review to FCP, keeping in mind that it will follow the AE interface should you desire to apply its effects within AE. As its name would imply, Swim creates distortions that seem to have a wave-like appearance. Swim effects can be used as a filter with keyframed animation as well as an organic-appearing transition. Another way of describing Swim's effects is that of a turbulance-based effect. Where the plug-in excels, however, is in the design patterns which it creates. It is able to generate a perceptible pattern to the viewer, giving your viewers the ability to "grab onto" a recognizable pattern. Furthermore, as it progresses through its turbulance path, its exit path differs from its entry path. This makes the result less predictable to the viewer, while still providing that recognizable pattern I mentioned above. How is it that Profound Effects can deliver such a powerful little plug in? Simple. The folks at Profound Effects are the same people who brought us the award-winning morphing application Elastic Reality. Distortion effects come naturally to them. Let's get a quick look at the Swim interface. There are few parameters and they are well-explained in the accompanying pdf documentation. Beyond that, just experiment and watch your results. In fact, I had a very hard time pulling myself away from the application just to write this review. Of course, you immediately see that the effects are may be animated. A completion of 50% represents the maximum total distortion. Thus 0%-50% moves from no distortion to maximum while 50%-100% eases out of the distortion. "Seed" furnishes the plug-in the initial setting for its random number generator to create the distortion. It should not be animated. Seed, in effect, defines the effect's overall appearance. Signal Wavelength, Signal Amplitude and Signal Phase combine to define the distance between two rippled peaks, the height difference between a peak and a ripple value, and the number of ripples respectively. It sounds more complex that it really is. Just experiment. The documentation provides some suggestions for achieving different types of effects. The Inverse Noise Amplitude and Wavelength parameters control the noise patterns which form the basis of the effect. 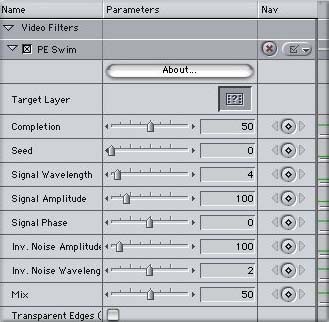 Inverse Noise Amplitude controls the strength of the noise pattern and Wavelength the intricacy of the distortion. These should not be keyframed for best results. When used as a transition, the mix function controls the percentage of the mixing of the two layers. Yes, that was pretty obvious. But, once beyond the mathematical terminology and concepts of the other parameters, the use of the plug-in is just as obvious and intuitive. Here are several examples of an effect keyframed over time starting from 0% through 50% and ultimately to 100%. Using Swim as a transition both in FCP and in AE is a little more of a challenge. Simply over lay two clips of equal length in the timeline. I find the easiest way of doing this is razor-blading an equal amount from the outgoing and incoming clips. Apply Swim to one of the layers. Drag the other layer from the timeline to the Target Layer well in the Swim Interface. That means that the effect will be applied to that specific layer. Then animate in order to create the transition. If you are using the AVX 1.0 version with an Avid system, then Swim can be directly applied as a transitional effect without the need for razor blading and layering. There you have it. It is cute, it is simple, it is fast and it is stable. There really is nothing else like it in any other plug-in currently available for FCP. Now, the big question is whether you need it. I find that plug-ins and effects are like clip art back in the "old days" of "Desktop Publishing" (ugh, I hate that term, but this is neither the time nor the place for an excursus on irritating jargon). You never seemed to have the piece of art that you actually needed. There very well may come a time when you need a turbulance plug-in such as Swim. At $79, it is not prohibitive and can just sit there until that one scene which would be made so much more effective by the application of that effect. So many users seem to ask for effects a la carte rather than be compelled to purchase extensive (and often expensive) collections. Swim does one task. It does it well and it doesn't break the bank in doing it. This one is a real buy. Download it and stick it in your plug-ins folder. I guarantee you will spend a few hours playing with it at first and then one day when you need it, you want be frantically posting in all caps on every support web site in the universe "URGENT!!! WHERE CAN I FIND" You will already have it.